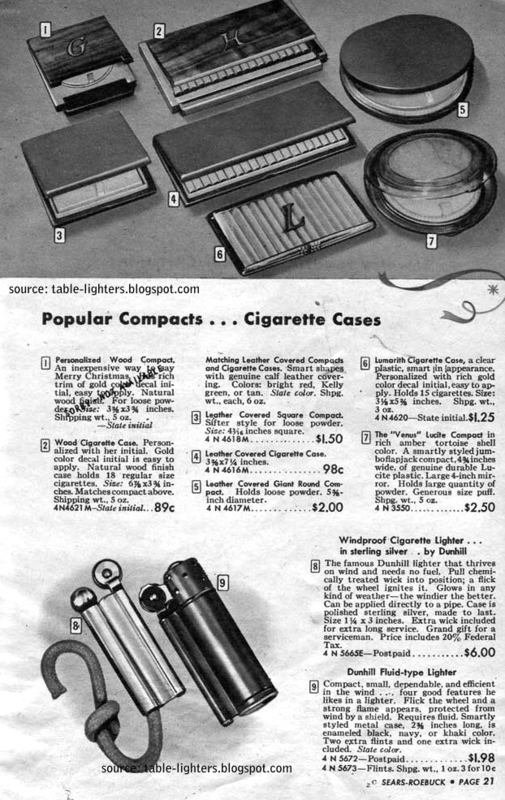 Another example of smoking accessories presented in Sears Christmas Book in years: 1942, 1944 and 1946. 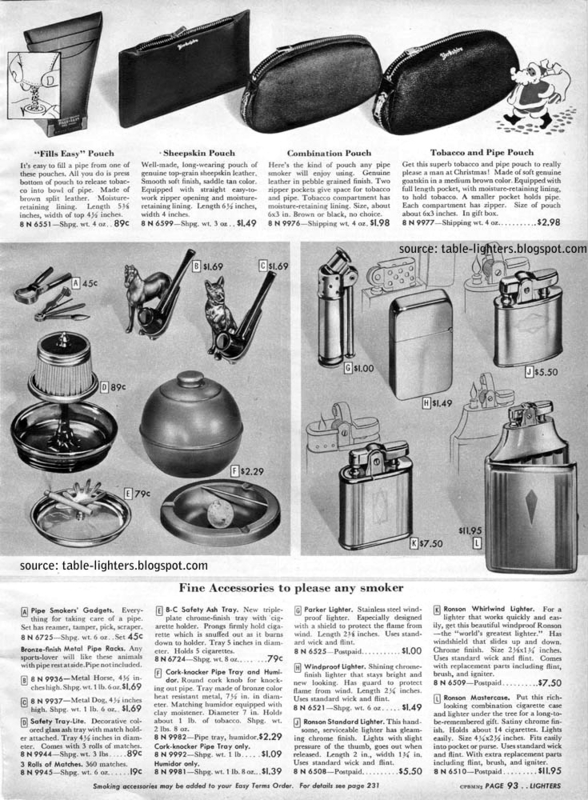 The Sears Christmas Book from 1942 features Evans and Ronson lighters and case/lighter combinations. 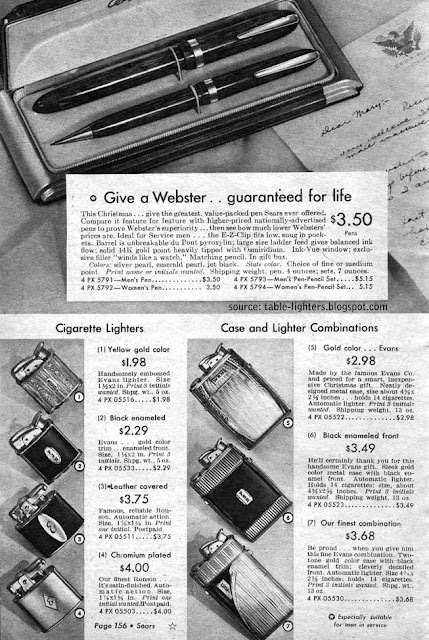 The Sears Christmas Book from 1944 features two Dunhill fluid-type lighters. Sears Christmas Book 1946 features the omnipresent Ronson Crown Table Lighter. Sears Christmas Book 1946 features the Parker Lighter, Windproof lighter, Ronson Standard Lighter, Ronson Whirlwind Lighter and Ronson Mastercase and many other smoking accessories like pipe racks and ashtrays. 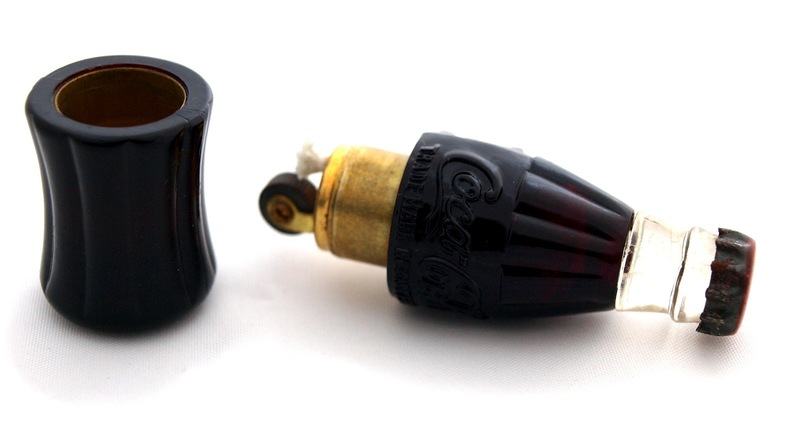 The Pepsi-Cola advertising cigarette lighter was manufactured in 1955 in Algonac, Michigan in the United States by Kem for Pepsi-Cola Company (now PepsiCo). 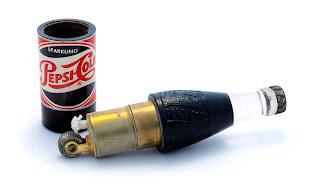 In late 1940s and 1950s the Kem Co. was a famous manufacturer of advertising lighters in shape of bottles and cans made both of metal or plastic. The metal crown on the top is marked: Pepsi-Cola. The two halves pull apart to show the simple wick and wheel type lighter made of brass. It is not marked. On the front of the bottle the label SPARKLING Pepsi-Cola is painted. On the other side the slogan: The Light Refreshment is placed. The campaign based on this slogan started in 1953. 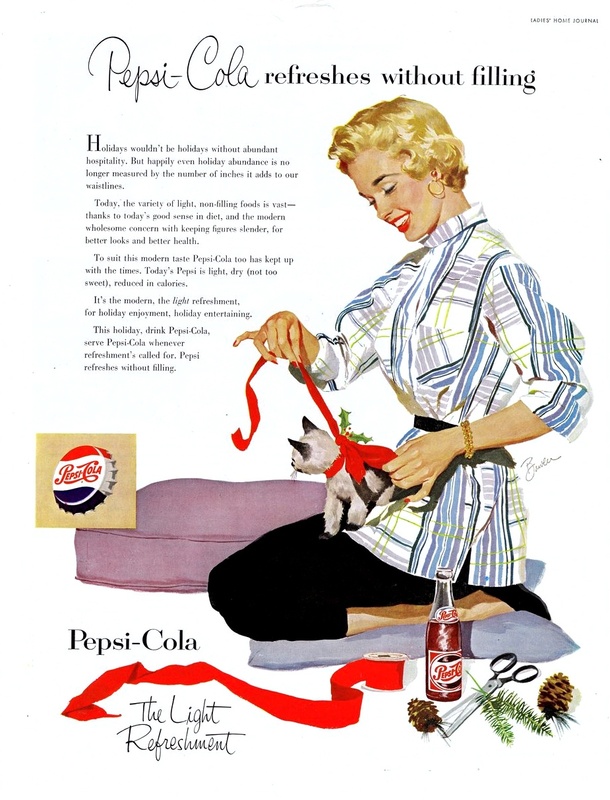 It capitalizes on a change in the product's formula that reduces caloric content of Pepsi-Cola. 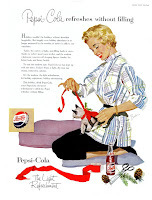 This marketing strategy was applied as more and more Americans became weight conscious. Ronson's place as a leader and pioneer in the manufacture of fine decorative metal wares from the 1900s to the mid-1930s is documented here. 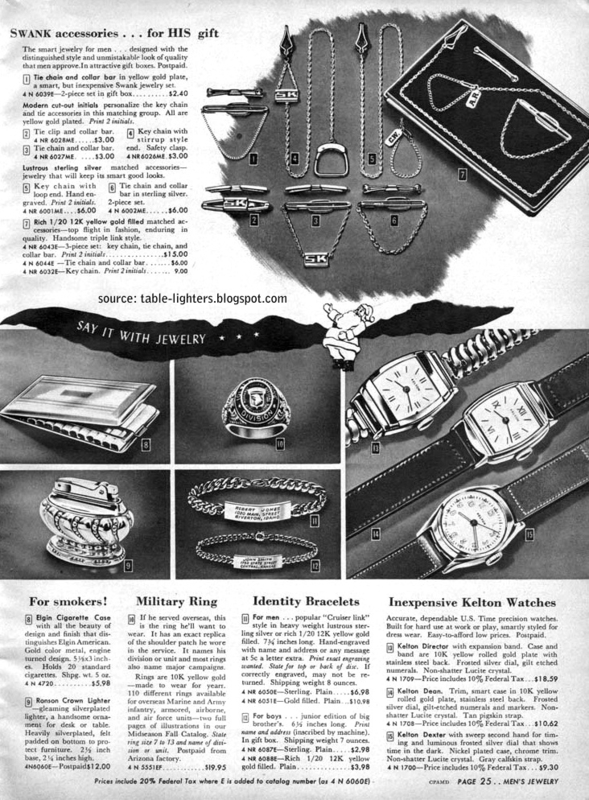 In addition to cigarette lighters, for which Ronson is most readily known, the company, then known as Art Metal Works, also produced a diverse selection of metal bookends, hood ornaments, statuary, aquarium and plant stands, clocks, pipe holders, desk sets and accessories, figurines, novelty items, lamps, boxes, toys, incense burners, and much more. With descriptive captions and information from original company catalogs and advertisements, alongside full-color, detailed photographs, this book is like no other on the market today. Whether you are a collector of art metal or a student of art and design, you are guaranteed insight into the style, beauty, and value of some of the finest metal wares manufactured. Stuart Schneider lives just outside New York City. He is an accomplished photographer who currently scouts cemeteries in the day and sees and senses what is there. He returns at night to capture his images. One out of a hundred have something unusual, most do not. The color photos are evocative and draw you in as if you are actually standing there and seeing what the photographer saw and felt. These are not the typical orb or streak-type ghosts that ghost hunters often get, but full formed, vaporous apparitions. He has visited haunted cemeteries throughout the world. His latest books, "Ghosts In The Cemetery" and "Ghosts In The Cemetery II, Farther Afield" are best-selling works, melding storytelling, photography, and beautiful imagery together. The Ronson's Art Metal Works is a typical collector's price guide as it consists primarily of pictures and captions. In the first part of the book Stuart Schneider tells the history of Art Metal Works as a company that became famous through the innovative and stylish metal wares produced since the 1880s. Also some competitors are named and different model finishes are described. In the second and main part of the book the reader might be astonished of the wide product portfolio of the company which was limited mainly to cigarette lighters and associated items after the end of WWII. 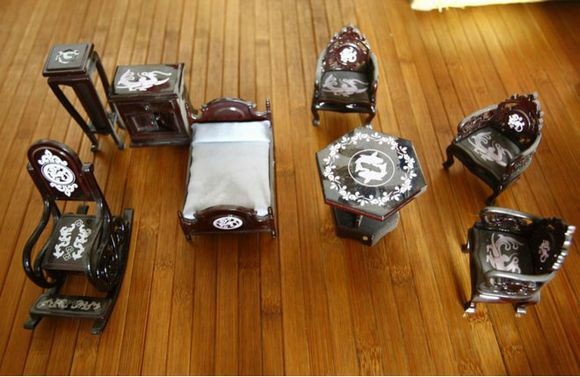 Till then the company though was producing various items like aquarium stands, bookends, clocks, door steps, incense burners inkwells, hood ornaments etc. Although the AMW is famous for its smoking antiques like ashtrays, cigar and cigarette art, pipe holders, tobacco jars and of course striker lighters, touch-tips only few examples are mentioned in this book which is a shame. Half of the hudered-fourty-four-page book is devoted to bookends which makes the representation of items unequal. The book, as you would expect from Schiffer Pub, has everything what a reference book should contain, that is a good index, bibliography (modest but all right) and quality photographs. The book contains over three hundred full-color detailed photographs with descriptive captions which are very accurate as in most cases they are derived from Ronson catalogs. They do include present valuation, production year and in most cases information on type of finish, size and model number. Not only photographs of single items can be found in this book - also scans of original AMW catalog pages and price lists which are optimal sized and legible, are present. One can wish more of them were included. Moreover only few photos of the items actually have a pure white background. All others presenting Ronson ware are half-baked and the color is in different tones from gray to ivory which is for sure a week point of this book. Overall this hard cover book makes an very good impression. As it is the only price guide fully devoted to Ronson AMW it is a must have for collectors. It is relatively a little bit overpriced as the recommended retail price is $39.95 but fortunately one can get it cheaper (less than $30) here. one must though admit that for a lighter collector who is not interested in the bigger picture of the Ronson products this book wouldn't be the best choice as only a very limited number of smoking antiques are represented. Collecting charms is a field that a lighter collector may find intriguing and appealing. A charm is a small, especially gold or silver, object worn on a chain or bracelet as jewelry. 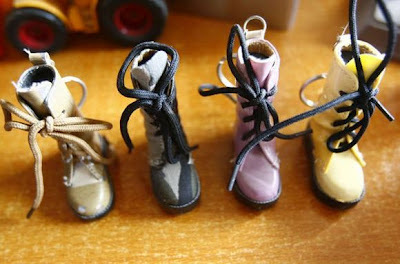 Most charms are about the size of a dime which makes them very difficult to craft, especially the once with moving parts. These tiny treasures have a rich history going back to antique civilizations like Phoenicians, Egyptians, Greeks and Romans. The modern “golden age” of charm jewelry was between 1930 and the early 1970s. 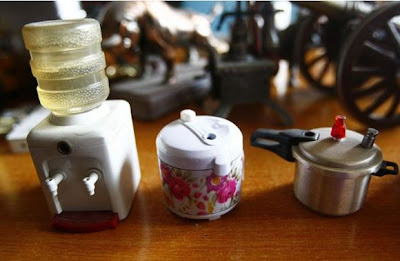 A great variety of objects are replicated in charms – animals, furniture, kitchenware, automobiles, buildings, sports, technology and many others. In general vintage gold and silver charms are available at different price levels. Simple charms are found in number jeweler stores and catalogs for as little as ten dollars. More elaborate made of gold, platinum, diamonds and rubies range from hundreds to thousands dollars and can be found for instance on eBay and at auction houses. Charms that main theme is smoking accessories are relatively uncommon. The biggest collection on cigarette lighters charms I know counts 50+ different lighter shapes, mostly pocket lighters. Most of them was made in the 1950s, 1960s, 1970s and today (grand reappearance) mainly in the UK and USA. They are made of gold (mainly 9K, 10K, 14K, 18K and gold filled) and sterling silver. The identification marks if present are very small. 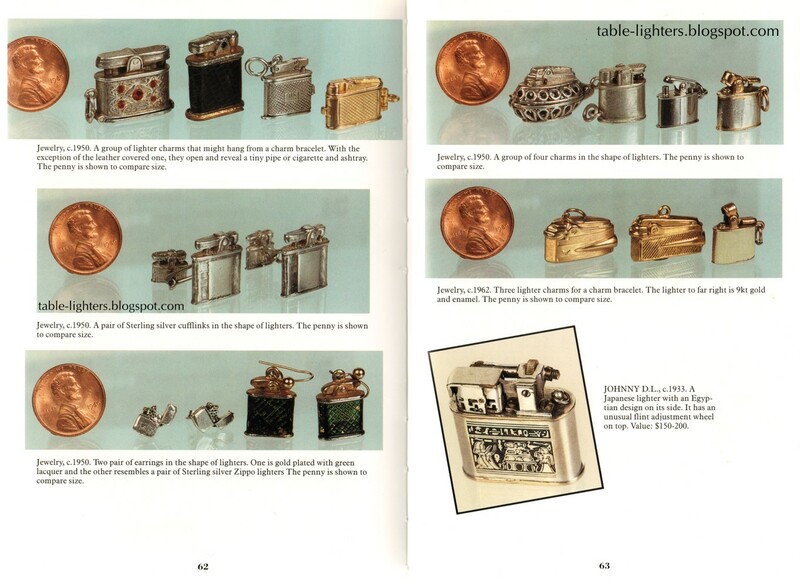 Part of a nice collection of lighter charms can be found in The Handbook of Vintage Cigarette Lighters written by Stuart Schneider and Ira Pilossof. The authors show also other jewelery like cuff-links, earrings or stickpins in shape of lighters. The Handbook of Vintage Cigarette Lighters shows nice examples of charms in the shape of lighters. PS. Charms might be a great gift for your beloved one and a memory trigger! Lighters Collectors' Forum now reopened! Not too long ago in 2010 I have created the Cigarette Lighters Collectors' Forum. Unfortunately after 8 months I gave up - my experience on running a forum was insufficient and I lost the battle with spam bots that flooded the forum with useless advertising posts. Today I would like to announce the reopening of the forum in a new domain: forum.table-lighters.com. The forum runs on the newest and probably the best forum software available in the web. Please note that the account activation is done manually by the administrator which means you will have to wait some time for the activation email to begin with posting. I hope that this time we will menage to create a fantastic and supportive community. Feel free to post your thoughts and questions. This small Coca-Cola advertising cigarette lighter was manufactured from 1953 to 1956 by an unknown Japanese manufacturer exclusively for Coca-Cola Company. 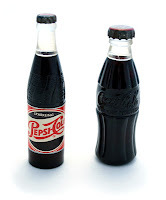 It was a great and popular giveaway in shape of the a Coca-Cola bottle. The lighter was made of modern transparent plastic (no Bakelite). 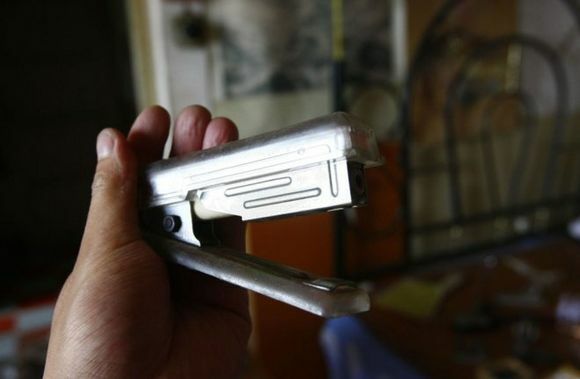 The lighter was patented by Ryotaro Hosaka in 1953. 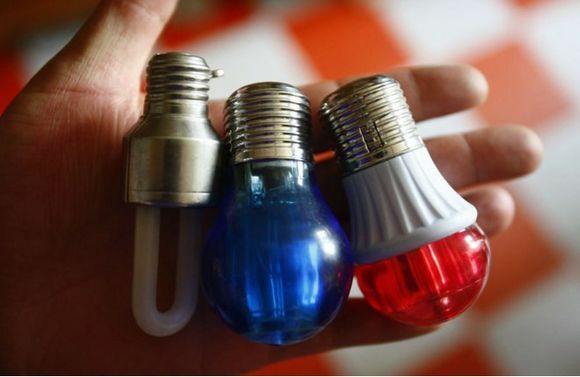 The best place to live for a collector of novelty lighters is - without doubt - China that is the source of production of an uncounted number of lighters in various shapes and sizes. Cui You a Chinese 71-year-old pensioner and devoted lighter collector would agree on that statement. 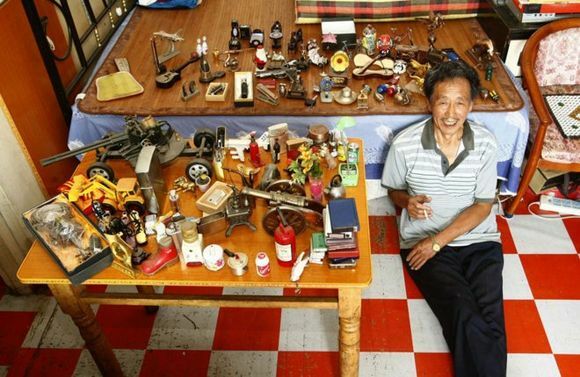 His collection counts more than 4500 figural lighters which he collected since 1980. And the beginning was very innocent: "A friend gave me a knife shaped lighter after he had business trip to Shanghai. From then I started to pay attention to special looking lighters". His favorite lighter? 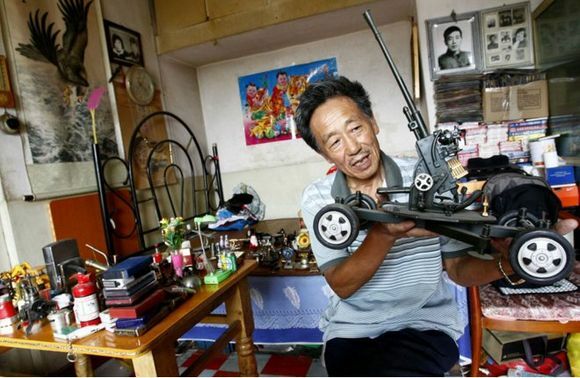 The one in shape of an anti-aircraft gun. PS. 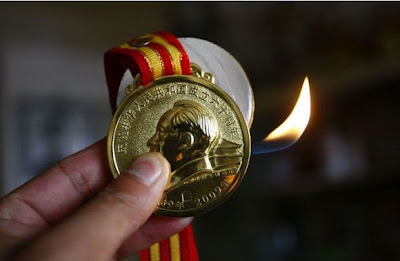 It is worth to know that in many countries the sale of novelty lighters (that resemble objects that are particularly attractive to children) is prohibited (for instance in European countries, Australia, some of the USA states). Nobody can give you advice after you've been collecting for a while. If you don't enjoy making your own decisions, you're never going to be much of a collector anyway. From the book The Greatest Collecting Tips in the World written by Tracy Martin.